Chef Steven Satterfield | Recipes - Find. Eat. Drink. “Celery cream” is a simple idea: steep cream with celery, aromatics and herbs, then strain and use. This is the basis for one of Miller Union’s signature dishes, which we serve as a first course, but makes an outstanding breakfast or brunch entrée at home. I’ve come to realize that its power is in its simplicity, but timing is everything. 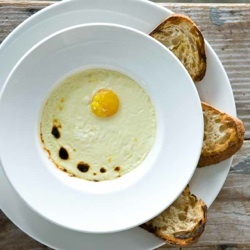 A farm egg is cracked into a ramekin and doused in the warm celery-infused cream, then baked until the white is cooked through and not a second longer. The briny hint of celery permeates the thickened cream as it becomes one with the egg white. The best way to eat it is to puncture the runny yolk with a corner of your bread and drag it straight through the molten mixture of savory cream and just-set white on the way to your mouth. Although we serve this year-round, in the winter we add some of the freshly harvested celery from our local farms. 1) In a small saucepan over medium heat, melt 1 tablespoon butter until foamy. Add celery, shallot, onion, salt, peppercorns, bay leaf and thyme. Cook the vegetables, stirring frequently, until the onions are translucent, about 5 minutes. With a wooden spoon, smash the cooked vegetables against the bottom of the pan to release more of their flavors. Add the cream to the pan and heat until it begins to simmer. Remove from heat and let steep for 20 minutes. Strain the cream into a medium bowl, gently pressing on the solids. Discard solids and reserve the flavored cream, keeping it warm. 2) Heat oven to 350 degrees F. Lightly butter two 6 to 8 ounce ovenproof ramekins or bowls and place them on a baking sheet. Crack one egg into each ramekin or bowl, being careful not to break the yolk. Spoon ¼ cup of the warm celery cream over each egg. The cream just should just cover the egg but with the yolk slightly protruding across the top. Slide the baking sheet with the 6 ramekins or bowls onto the middle rack of the oven. 3) Bake the eggs and check them after 5 minutes. As soon as the whites start to set around the edge of the ramekin or bowl, pull the eggs from the oven and set aside. The eggs may be slightly undercooked but will continue to cook with the residual heat for the next few minutes. 4) Turn oven setting to broil. Brush bread on both sides lightly with olive oil. Broil the bread for 1 to 2 minutes on each side until warm and toasted. 5) If the whites of the eggs still need to cook a little longer, the eggs can run under the broiler briefly, but take extra precaution not to overcook the yolks. With the broiler on and the oven door propped open, position the ramekins 8 to 10 inches below the heat source. Watch carefully while the surface of the egg begins to cook. It is fine if the whites brown slightly but goal is to keep the yolks runny. Serve immediately with the warm, toasted bread. 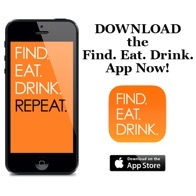 More photos and follow us on Instagram at FindEatDrink. Copyright ©2014 Find. Eat. Drink. LLC All rights reserved.